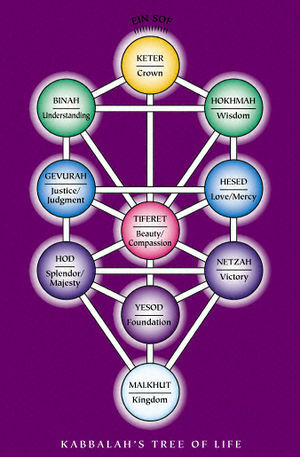 Difference between revisions of "Sefirot"
The ''sefirot'' are names which God gave to himself, each part of himself having a specific name with a specific vibration that we could access through the universal “computer” of the mind of God. The ''sefirot'' bridge the gap between the finite creation and the infinite God. 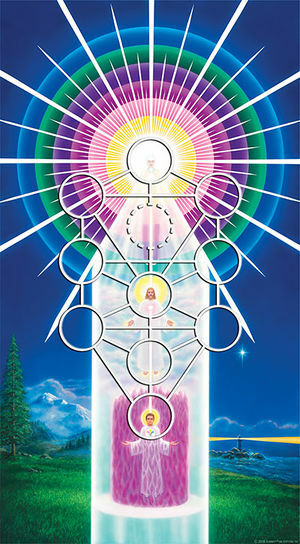 Kabbalists have used many synonyms for the ''sefirot'' including: emanations, vessels, lights, stages, pillars, garments and inner faces of God. Each name describes another aspect of the nature and function of the sefirot. [[Kabbalah|Kabbalists]] have used many synonyms for the ''sefirot'' including: emanations, vessels, lights, stages, pillars, garments and inner faces of God. Each name describes another aspect of the nature and function of the sefirot. The tenth ''sefirah'', ''Malkhut'' (“Kingdom”), also called ''Shekhinah'' (“Divine Presence”), is at the base of the Tree of Life. In Kabbalah, ''Shekhinah'' figures as the mother of the world. ''Malkhut/Shekhinah'' is at the nexus of two worlds, representing the point where spiritual and physical forces meet. In the world of the ''sefirot'', she is the lowest point; in our world, she is the uppermost point. Thus ''Malkhut'' serves as both the channel through which the divine forces of the ''sefirot'' flow downward to this world as well as the gate through which we on earth reach upward to God. ''Malkhut'' is the gate we must pass through as we begin our ascent up the ladder of the ''sefirot'' to ''Ein Sof''.